Forest Green came from behind to beat play-off rivals Woking and climb up to sixth in the Conference. The visitors would have gone second with a victory and went in front through Dean Morgan's turn and shot on the edge of the area. Rovers turned it around as Elliott Frear's cross was finally bundled in by Jon Parkin and Luke Oliver headed home Marcus Kelly's corner. Sam Russell made a string of saves to deny the Cards a late leveller. "It was a great performance in horrible conditions. It was a massive three points. "We showed everything, it was great. I'm buzzing about it. "It's massive because if they'd have won today, there would have been a gap between us. "Now it's only a point and we're in the mix." Match ends, Forest Green Rovers 2, Woking 1. Second Half ends, Forest Green Rovers 2, Woking 1. Hand ball by Sam Wedgbury (Forest Green Rovers). Attempt missed. Dean Morgan (Woking) right footed shot from outside the box is too high. Substitution, Forest Green Rovers. Chris Stokes replaces Elliott Frear. Substitution, Woking. Keiran Murtagh replaces Adam Newton. Substitution, Woking. John Goddard replaces Chris Arthur. Attempt missed. Marcus Kelly (Forest Green Rovers) left footed shot from outside the box is too high from a direct free kick. Attempt saved. Josh Payne (Woking) right footed shot from outside the box is saved. Attempt saved. Jack Marriott (Woking) header from the centre of the box is saved. Offside, Forest Green Rovers. Clovis Kamdjo tries a through ball, but Clovis Kamdjo is caught offside. Substitution, Woking. Jack Marriott replaces Giuseppe Sole. Attempt saved. Joey Jones (Woking) right footed shot from outside the box is saved. Rob Sinclair (Forest Green Rovers) is shown the yellow card for a bad foul. Josh Payne (Woking) wins a free kick. Second Half begins Forest Green Rovers 2, Woking 1. First Half ends, Forest Green Rovers 2, Woking 1. Attempt blocked. 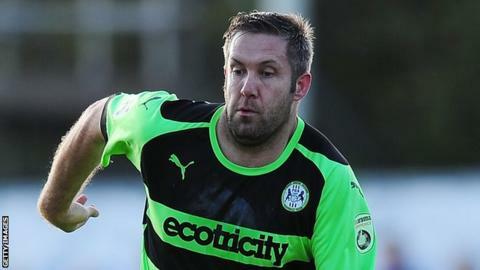 Jon Parkin (Forest Green Rovers) right footed shot from the centre of the box is blocked.